7th annual food and shelter charity car show-July 28 -we raised $3799 for Food and shelter! Photos from this year's cRc car show - Tim's 1920's era Dodge is lookin' good! Harold's 1965 metallic blue Corvette is enjoying the day. also clearly visible is Terry's yellow and white 1955 Chevy. A nice line of guest vehicles graces the park and makes the show really special. This is a beautiful guest's Corvette fastback. All vehicles are welcome at the show. A one-of-a-kind rat-rod is one of our entires. Posted July 16 - What are YOU doing on July 28? 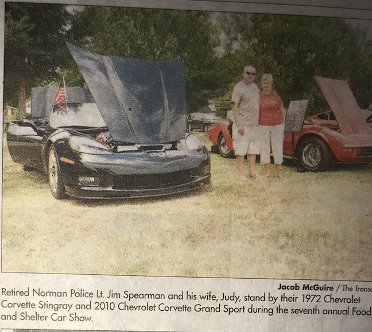 Hopefully you will consider attending the 7th annual Food and Shelter car show at ANDREW's PARK in downtown Norman. We have posted a map so you can find us. 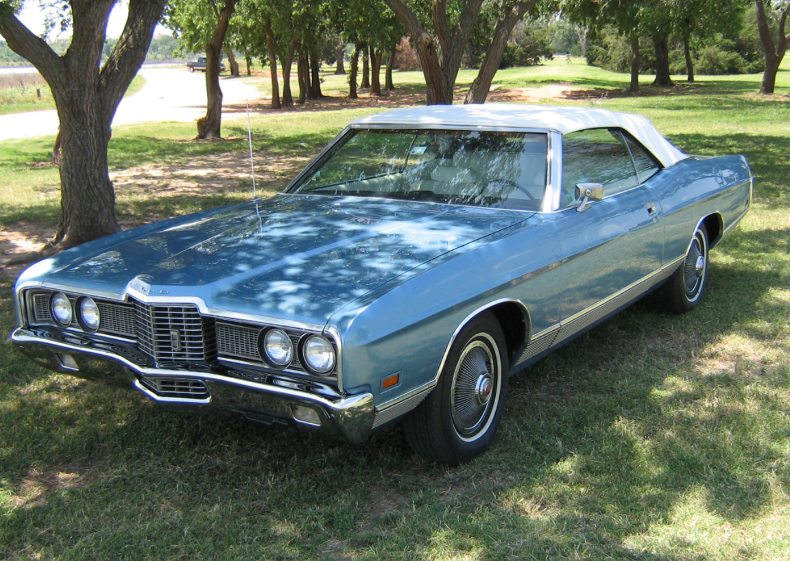 acres of grass in the park to display your classic vehicle. A streamlined registration system that we hope will get you parked and busy putting the final touches on your 2 or 4 wheel beauty. A hot dog stand provided by MIDWAY GROCERY AND DELI, one of Norman's favorite hide-away restaurants. 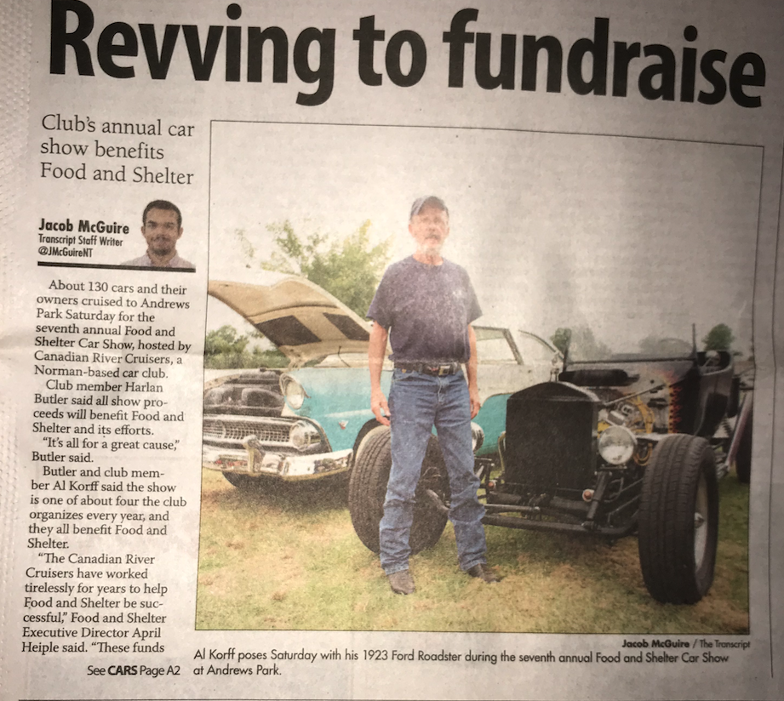 For years, Owner Bob Thompson and his family have set up the grill and personally flipped the burgers of dogs, and have donated 100% of the money taken in, to Food and Shelter. Now the profit, the entire till. That is also what the cRc will do - the entire funds received during the day will go to our select Norman Charity. and over the years, $31,000 has been donated to assist their mission - to rehabilitate one-person-at-a-time and to provide a healthy and loving environment while they do it. If you don't know about the amazing work that Director April Heiple and her staff and board do for the homeless of the Central Oklahoma area - you should go by one day and just observe. Did we say we will have the best music, the finest trophies and the nicest cars around? We will. our objective is to transform this show into a regional event for the Central Oklahoma area. A place that citizens who do not have a classic car can go to look and appreciate. Please plan to come whether you have a car or not - just come and hang out and enjoy the music, buy a hot dog, or a 50/50 pot ticket (our part of the pot goes to Food and shelter also), and just be a part of the event. We have the best music anywhere! our member Harlan Butler has spent countless hours making a quality and fun track to run behind the scenes at the show. from Jimmy Buffet to The Ink Spots to Jan and Dean, Harlan has a little music for everyone and a fun adventure for all. Nobody beats Harlan's music, not even the pros. We have the best trophies anywhere! Car show season is almost upon us and we are well into planning the club's 7th annual cRc car show. 100% of the money raised at this show is donated to FOOD and SHELTER in Norman to further their mission of rehabilitation and help for the homeless in Central Oklahoma. To date our club has donated more than $31,000 to Food and Shelter. NOTE: CRC MEMBERS WILL BE ISSUED A "HOST" CARD FOR YOUR WINDSHIELD. HOST CARS WILL NOT BE ELIGIBLE FOR JUDGING OR TROPHIES.